Overprinting is another customization technique that can add text, data or graphical elements to the hologram label. Overprinting is done by printing elements directly on top of the label surface via ink jet printing, flexo-printing or other forms of printing. This printing can be performed in several colors and is often used for serialization purposes. The advantage this form of printing has over laser-etching is that it is more visible on the label than laser-etching and can be done in multiple colors with greater detail. The disadvantage over laser-etching is that the printing occurs on the label surface, unlike etching which is performed on the adhesive side of the label. This leaves the printing vulnerable to wear and tampering, although in most cases overprinting is preferred over laser-etching. 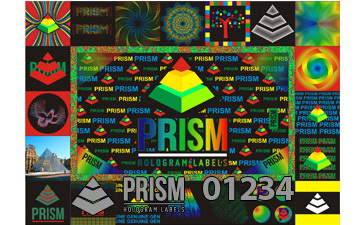 Overprinting can also be used to print text, data or graphical elements on to generic hologram labels. This can provide clients with a semi-custom solution at a lower cost than producing full custom hologram labels.